Make it easy on yourself. Ride TRAX if you’re coming from Salt Lake City or Draper or points in between. The Sandy Expo station on the Blue Line is conveniently located across the street from our facility. FrontRunner from Ogden and Provo links to TRAX and you can ride the light rail to and from Salt Lake International Airport. From I-15 heading northbound: Take Exit 293 (UT-151/10600 S.). Keep right to take ramp toward Sandy and the Mountain America Expo Center. Turn right onto W. 10600 South. Turn left onto S. State Street (US-89 N.). The Mountain America Expo Center is on the right. From I-15 heading southbound: Take Exit 295 (UT-209/9000). Keep left and then go straight towards Sandy on 9000 S. Turn right onto S. State Street. 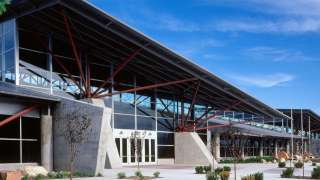 The Mountain America Expo Center is on the left. View the map below to get a good overview of the parking and transportation options.